Pool is an 8-ball variation of the Pool game, which is played on a 6-pocket pool table with a full rack of 15 balls & a cue ball. Your aim is to pocket all your 7 colored balls assigned to you (either Solids or Stripes) and then ultimately pocket the 8 ball before your opponent. A recent addition to MPL, Pool is only available in battle mode. This game has become one of the most popular 1vs1 battle games in a short time. So rack ‘em up and get ready to prove your skills against other players at this game of 8-ball. Since it is based on an actual sport, therefore pool is categorized into the Sports genre. Continue reading to know the rules in detail and also learn some tricks that can help you win the battles and win more money on MPL. 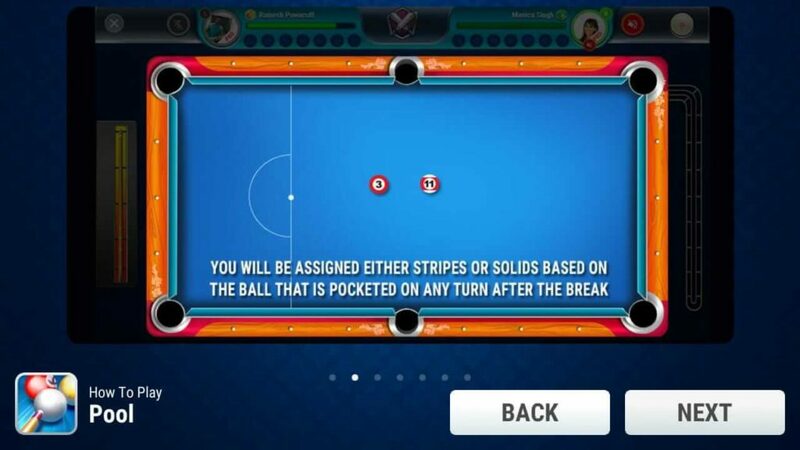 The rules of Pool on MPL follow all the original rules of the 8-ball pool game. This game can only be played in battle mode. Both players take turns one by one and try to pocket all their assigned balls followed by the 8-ball. The player who legally pockets the 8-ball after pocketing all his/her colored balls wins the game. Table: You are provided with a standard virtual pool table with six pockets; one at every corner (corner pockets) and in the middle of each long side of the table (side pockets or middle pockets). Cue Stick: A cue stick is provided which you can drag to move and take the aim. Balls: You are provided with 15 Numbered Balls (Solids and Stripes) and black 8-ball. Along with this you have the white Cue ball. Game beginning setup: Once the game begins you are provided with a professionally set up rack of the balls (in the form of a triangle) at the opposite end of the head spot where the cue ball is put. The 8 Ball is placed in the center of the triangle. Break: One player is assigned to break the rack by aiming at it with the cue stick. Try and knock the cue ball into the triangle of balls with utmost precision and full force. If the player is unable to break within the given time then the opponent gets a chance to do so. Assigning Solids & Stripes: You will be assigned either the Stripes or the Solids based on the ball that is pocketed on any turn after the break. When the player who breaks the rack, pockets a colored ball in the same hit, he/she gets another turn to decide the assignment of solids and stripes. If he/she is not able to pocket a ball the opponent gets a chance to do so and decide solids/stripes assignment. If the opponent is able to pocket a ball without foul, then whichever ball (stripes or solids) is pocketed first is assigned to them. Turns: This game is played in turns where the person who breaks the rack goes first. If he/she pockets the ball in the same hit then the same player continues to play until he/she misses pocketing a ball or makes a foul. Pocketing Balls: After the assignment of solids and stripes, the player needs to pocket the same kind of balls, not doing so will result in a foul. Pocketing the cue ball will not only make you miss the turn but also give the opponent the opportunity to take the cue ball in hand and place it wherever she/he wants. Please note that the 8-ball can be pocketed only after you have pocketed all the assigned balls; doing otherwise will be a foul. Start Battle : In your MPL app select Battles and then select Pool. After that you can select the desired Battle Room, pay the required fees and Play! As mentioned earlier, you have to drag the cue stick to move and aim at the balls. Try to get a precise angle and proper force while breaking the rack so as to pocket a ball in the very first go. In this way the Solid and Stripes assignment would be done and you would continue to play. Failing to pocket a ball in the first hit will give the opponent a chance. While taking a shot make sure that the angle of the cue stick is correct and you have got a perfect aim. Depending upon the distance between the cue ball and aimed ball and also the distance between the aimed ball and the desired pocket will decide the speed. Using the force control properly is the key here. Spin control is something which you should use wisely and only when needed; you can move the strike point on the cue ball to spin. Move the strike point on the cue ball to spin. Once the assignment of the balls is done then begins your actual play. You will continue to play as long as you keep on pocketing the assigned balls. Otherwise the opponent gets a turn to play. Fouls can cost you either your turn or result in ending the game altogether. If you pocket your opponent’s ball or you do not touch your ball and/or touch the wrong one instead, you pocket the cue ball is a foul; this will result in loss of turn. If you pocket the 8-ball before pocketing all your balls the game ends. Game End & Winning : The aim is to pocket all the assigned balls then followed by the 8-ball before your opponent does so. The game also ends if one of the players pockets the 8-ball before pocketing all the other object balls. Be Careful of the cue direction after hitting a ball. If you pocket a cue ball, you give your opponent a ball in hand. Use force control judiciously to control how hard you hit the balls. Selection of Battle room as per you skill level is required to increase your chances of winning. Now that you know how to play this game of 8 ball, will you be able to adeptly direct the cue ball like a professional? Don’t forget to download the MPL pro app to ace the game of pool and win cash and tokens by crushing your fellow players. Also, do not forget to create that shortcut for your favorite game on your home screen. In case you need any help, check out our FAQs or contact support. Also let us know your feedback / suggestions in the comments section below.